Using a food processor, process rolled oats until fine. Add to a bowl along with the softened butter, stevia, salt, and egg yolk. Stir with a spatula until the mixture comes together and form the dough into a ball. Cover with plastic wrap and allow to rest in the fridge for approx. 30 min. Preheat the oven to 180°C/370°F. In another bowl, whisk together quark, crème fraîche, lemon juice, egg, stevia, and vanilla custard powder. Grease the tart tins with some butter. Roll out the dough, cut out appropriately-sized rounds, and transfer to the tins. Carefully fold blueberries into the cream and distribute evenly onto each pastry round. Baked in a preheated oven at 180°C/370°F for approx. 35 - 40 min. Remove and allow to cool. 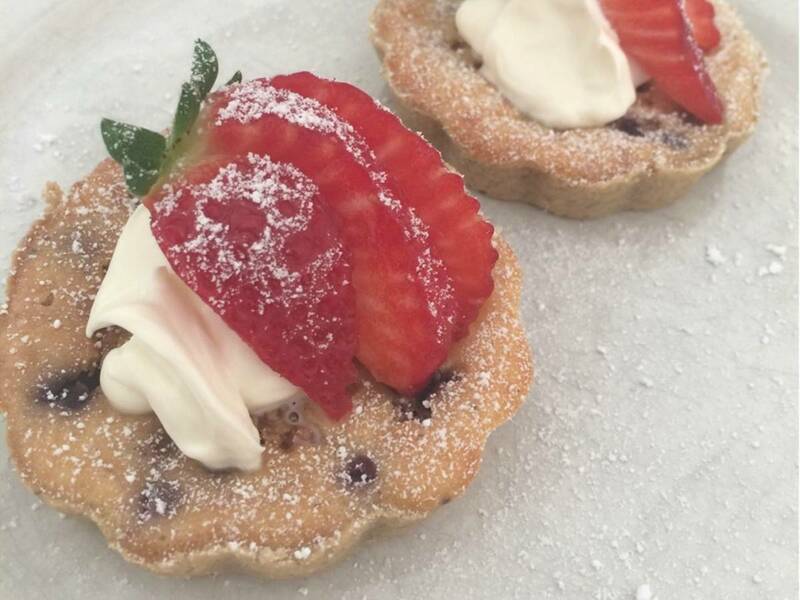 Remove tartlets from the baking tins and serve with a spoonful of crème fraîche, strawberries, and some confectioner's sugar. Enjoy!